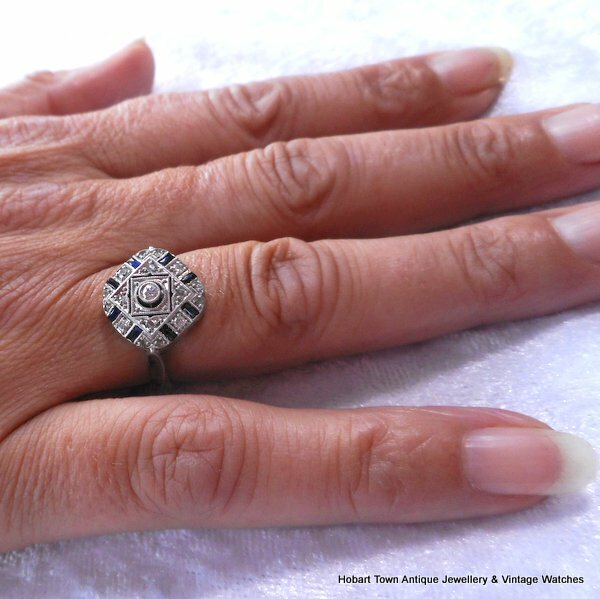 A Genuine & Authentic Art Deco Geometric Diamond Sapphire Platinum c1930 Ring in original condition! 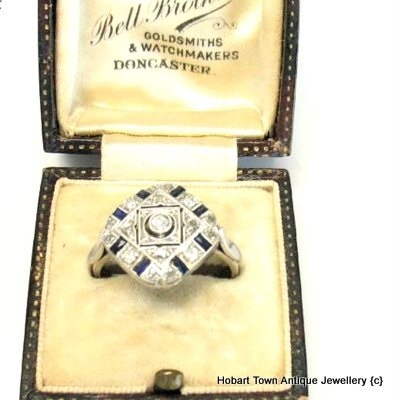 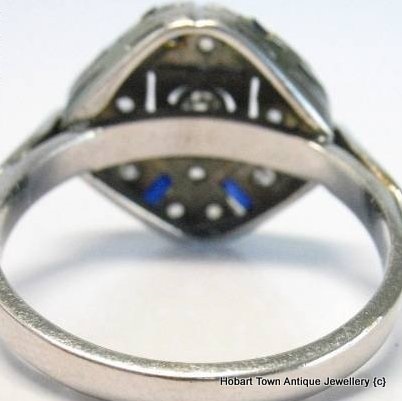 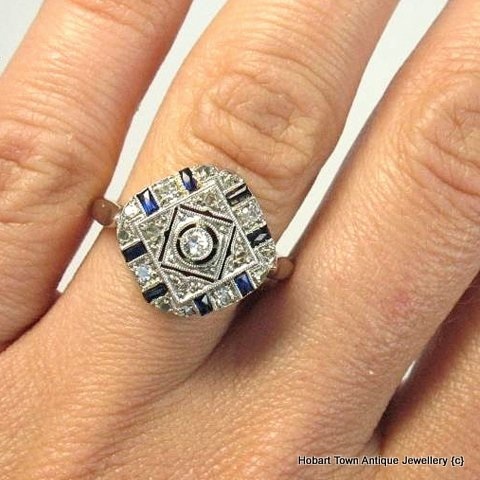 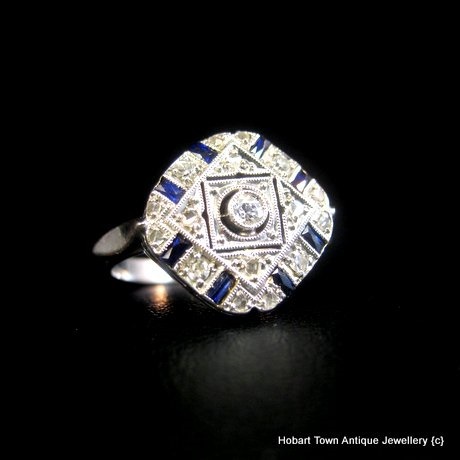 Such an outstanding example of a genuine 1920’s ~1930 art deco geometric pattern diamond & sapphire ring …….. original & authentic being other great aspects of this one! 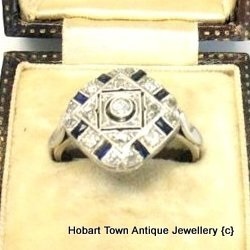 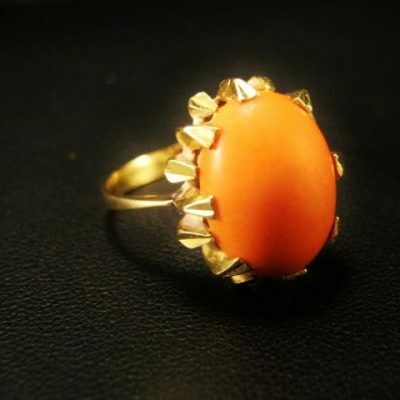 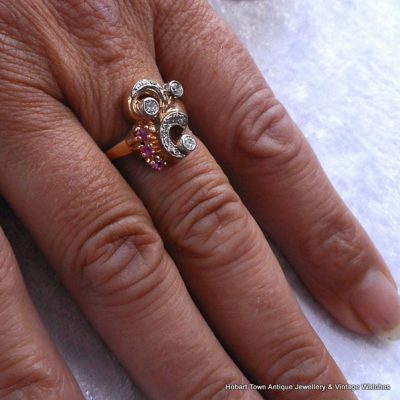 With such a high % of “art deco rings” on the market in Australia being reproductions , copies & often with very little to tell you that the ring is indeed not art deco at all , one must almost scream that theirs is authentic now a days! 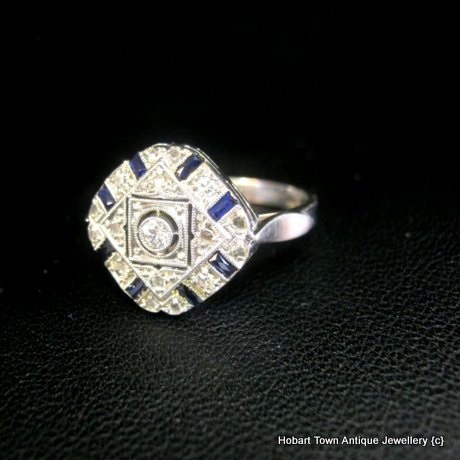 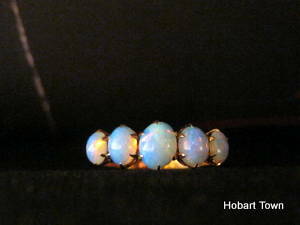 With genuine , natural earth mined sapphires & not coloured glass , as a great % of lesser quality examples have. 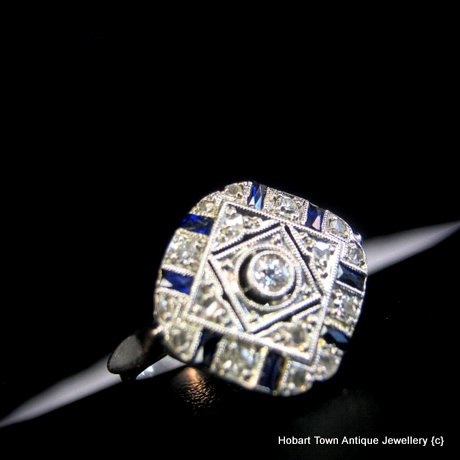 With an approx; .10ct H~Vs2 diamond to the centre with a further 16 x rose cut J ~ SI1 diamonds having an est; .15ctw , & A further 4 x single cut H~SI1 single cut diamonds of an est; .10cts ~~ providing .35tcw diamonds & combined with the 8 x baguette cut natural sapphires providing an est; .55cts of natural earth mined gemstones to this stunning Art Deco Geometric Diamond Sapphire 18ct Gold Platinum c1930 Ring in original condition! 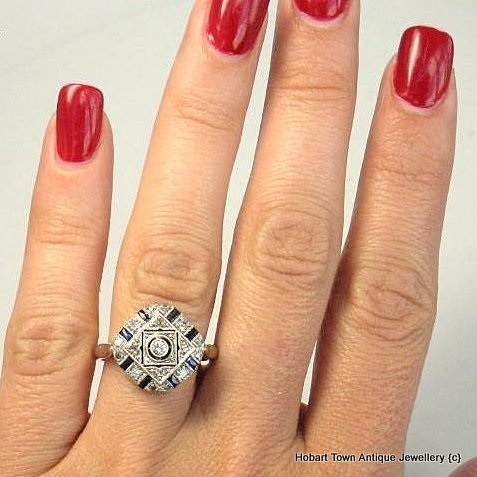 The complex , detailed & stunning pattern of the gemstones is one of the main features of this exceptional genuine art deco platinum ring & the main aspect that makes this stunner a much more desirable ring than almost all seen at this price especially! 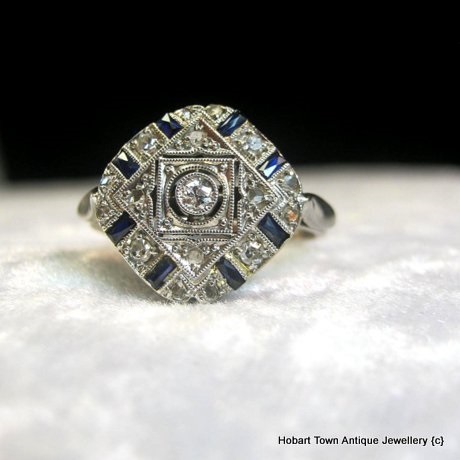 With this Authentic Art Deco Geometric Diamond Sapphire Platinum c1930 Ring being made from a very solid 4.7 gm’s of the ‘new substance’ called platinum ~ being an indicator of the quality of this gorgeous deco ring coming from both the weight & the Fact that Only the very finest quality rings were made from all platinum due to the fact that ~ Platinum cost twice / double the cost of 18ct gold for a jeweller to buy at the time this fine example was created! 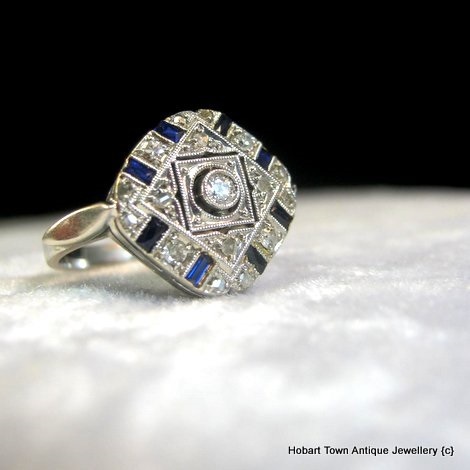 Once again , with only the finest quality rings of significant weight especially being made from all platinum ~ yet another indicator of the quality of this Authentic Art Deco Geometric Diamond Sapphire Platinum c1930 Ring ! 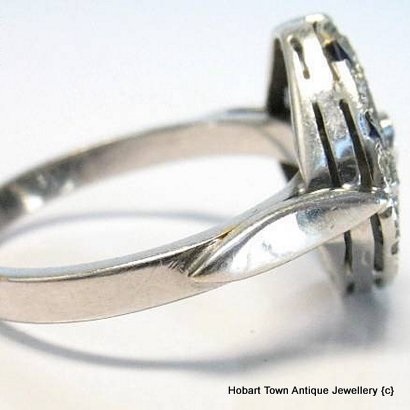 Currently a size Oz / UK “O and a half” or US size “7.75” ~ this ring can also be resized by a competent jeweller. 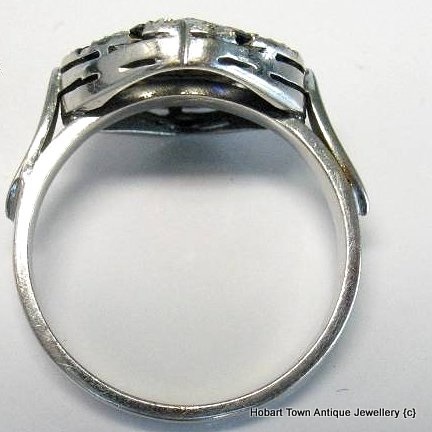 At approx; 14.5 x 14.5 mm ring head , this is a ‘Goldie Lock’s size ring. Not too large , not too small ~ just right proportions for the vast majority of women’s hands. 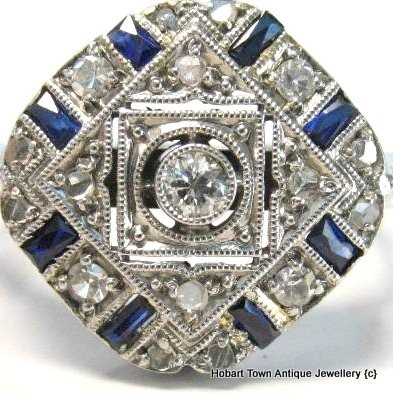 Please email with any questions that you may have & we will respond promptly.